Bill Murray’s Oscar clip comes exactly twenty minutes into Lost in Translation. His character, Bob Harris, a famous actor like Murray himself, is in Japan to film a series of commercials for Suntory whiskey. At a photo shoot for the ad campaign, Harris sits propped on a stool and mugs for the camera according to the photographer’s instructions. It’s a twisted inverse of that cliché of the photo shoot scene, where a beautiful young model pouts and writhes for the camera while the sleazy photog barks demeaning commands while telling her she’s “beautiful, babe, just beautiful.” Instead, Harris struggles to understand what the photographer says—he has a thick accent and the studio is loud. The cloying tone of the frat boy photographer is replaced with a series of commands that are alternately too specific (“put your hand across your face”) and too vague (“more mysterious”). Rather than glamorous, Bill Murray looks decidedly rumpled, deflated by the inauthenticity of the experience, the bright overhead lights accentuating the furrows that began appearing in his face sometime between Space Jam and Rushmore. Everything about the shoot is carefully manufactured. Harris’s tux is cinched tight with large metal clips fastened along his spine. The glass is chosen from a few options according to which looks best in the light. The “whiskey,” as Harris mournfully points out, is iced tea. Harris is not so much being himself in the scene as he is rehearsing a series of masculine archetypes. He shuffles through Sinatra, Dean Martin, and James Bond (miffed that the photographer wants to see Roger Moore, not Sean Connery). The legend is that this scene was improvised on Murray’s part. He had no idea what the photographer would tell him. Whether or not this is true, the bewilderment is visible in his face as he tries to translate a series of cryptic instructions into minute adjustments of facial expression and bearing. If the legend is true, the scene is awe-inspiring. That Murray can summon Roger Moore or Frank Sinatra with no preparation, using nothing but his face, is the best kind of unbelievable: it’s magic. It is perhaps the single most dominant narrative of modern day manhood: the absent father trying to make good. In a few scenes scattered throughout Lost in Translation, it becomes clear that Bob Harris is one such father. Like a dad in an ‘80s movie, he works too much. Why doesn’t he spend more time with the kids, asks the synopsis on the back of the VHS box. He tries to explain his experiences in Japan to his wife, audibly harried and impatient over the phone, more interested in how he responds to her questions about her decorating projects than what he is feeling or thinking. Which, if you can look past Murray’s charisma to the character’s flaws, is probably fair. He’s drunk dialing her after a night out partying, while she tries to make breakfast for their children and get them off to school. His command across the phone, “Tell her I said eat something,” reminds me of every time my father, a thousand miles away, would call on Sunday nights and remind me to do good in school, or not to get any girls pregnant. This last piece of advice was particularly pointless. Had he known his awkward, bumbling, nerdy mess of a son any better, he would have known there wasn’t very much risk of his becoming a grandfather. What is it that brings us back to this figure? Why do we want to forgive Darth Vader, cheering as he throws the Emperor into the abyss, trusting that this is his true self despite his considerable sins, countless murders, and that excruciating pod racing sequence? Why do we side with Sean Connery in Last Crusade, wishing Indy would lighten up, even though Henry Jones, Sr. is the hardest father in history to please, a biblical scholar who is disappointed in a son who discovered the Ark of the Covenant? Why do we root for a reprobate like Royal Tenenbaum, hoping for him to reconnect with his children even after he has manufactured a battle with cancer in a misguided attempt to reconnect with them? (Bill Murray is in that movie, too, gentle, bearded counterpoint to Gene Hackman’s cantankerous patriarch). When I sat down to write this, I expected to take a harder line. I expected to write about the disingenuousness of a Hollywood system run by men who probably work incredibly long hours away from their families churning out film after film in which men are forgiven for that very failing. But sitting here, staring at a freeze frame of Bill Murray’s dopey face on my laptop screen, I realize that’s not something I can do. The truth is that, in my own way, I share my father’s aptitude for abandonment. Some of those examples are small, almost trivial. Others aren’t. In middle school, I stopped speaking to my best friend Ryan King, abruptly and forever, after he stole my Iron Man action figure. I have friends from college who would probably say, “We grew apart,” when, in reality, I worked very deliberately to excise them from my life, to cut ties after I felt that they’d wronged me in some way. I didn’t speak to my half sister, Elizabeth, for about six years, from the time she was 10 to just after she turned 16. It wouldn’t have been hard to find her—this was the early 2000s, when both of us spent countless hours of our lives chatting to various people on the internet. All it would have taken was for me to find out the right screen name. In college, before I started dating the woman who would later become my wife, I vowed, because of a drunken disagreement after we shared an entire bottle of Skyy vodka one night, to never speak to her again. (I lasted about four months before giving in). Then there’s my father. He called my older brother, Chris, a few months ago, trying to reconnect with us. It was the first time any of us had heard from him in about ten years. I haven’t called him back. Neither have my brothers. I don’t plan to. I always considered it a mark of pride, a sort of superpower, this ability to put someone behind you and forget that you’d ever cared about them. What you learn, the more you try, is that the break is never clean. The people you once cared about are always with you. They live inside you—the words they spoke, the things they taught you, the moments you shared. Lost in Translation is a movie about the durability of those relationships—Bob and Charlotte (the central character of the film, played to sleepy-voiced perfection by Scarlett Johansson) only spend a few hours together, spaced out among chance encounters in their high-rise hotel. In the film’s closing moments, Bob finds Charlotte on a crowded Tokyo street for a chaste kiss and a whispered exchange that the microphones don’t pick up, before leaving for home. It’s obvious that this brief connection has changed them, whether they ever see each other again or not. They aren’t the same people as they would have been if they’d never met. Bob Harris may not be the best father in the world. But given a life adrift from hotel to hotel, film shoot to film shoot, whiskey ad to detergent ad to car insurance ad, he didn’t do so bad. Lying in bed beside Charlotte, Bob talks about his children, how he was terrified when they were born, but how much he wants to be with them. His attitude about his frequent absences for work is believably self-effacing: “The kid’s miss me, but they’re fine.” Along the broad spectrum of paternal failure, he’s hardly even a blip. A few years ago I was talking to my brother, Chris, about Bill Murray. I asked him, certain that it would be a lifelong impression we’d always shared but never spoken, “Doesn’t he remind you of our dad?” Something about their mannerisms, the flat As of their Midwestern accents, their receding hairlines, the sideways glance they would both give when making a joke. My brother looked at me, frowning. “No,” he said, “he doesn’t, at all.” Only then did I see that he was absolutely right. It made me realize that almost every male actor reminded me of my father—Bruce Willis, Bill Murray, even Mel Gibson (although my father could never have rocked a mullet like his, circa Lethal Weapon 2). This perceived similarity had nothing to do with them, and everything to do with me projecting my father onto every image of masculinity that I came in contact with. Suddenly, it came to me, something that should have been obvious but I’d never confronted head on: Not all men are your father. 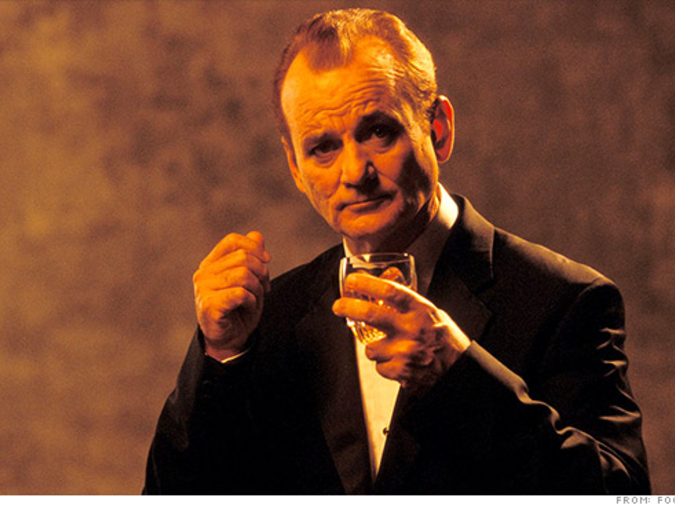 Bill Murray, wrapped in that tuxedo, holding that ersatz glass of whiskey, gives me something I’ve always been looking for: an image of masculinity that I can relate to. Those old archetypes, cowboy, action hero, womanizer—they’re all surface, posturing. What he is teaching us, as he puts on these faces and discards them, as he takes on these roles in satirical succession, is that masculinity isn’t fate. It isn’t a curse. It’s a role we play. And we can play it how we like. “I am not here to tell you what a man is,” Murray is saying. “I am here to tell you that it can be anything. We can be Dean Martin, or we can blush while singing the Cranberries sweetly and slightly off key. We can be 007, or we can sip sake on the bedspread and talk about missing our children. We can kiss someone on the mouth, or we can forego romance entirely and whisper an intimate secret into their ear.” There, behind all the acting, Bill Murray is telling us the truth.